Miley Cyrus' road to recovery is looking brighter, according to her dad. The 21-year-old "Wrecking Ball" singer was hospitalized in Kansas City on April 15 after suffering an apparent allergic reaction to the prescription antibiotic, Cefalexin. She was eventually released from the hospital after several days, but continues to remain under doctor's supervision. Her father, recording artist Billy Ray Cyrus, walked the red carpet in her place Thursday night at the iHeart Radio Music Awards in Los Angeles, where he told reporters that Miley is recovering nicely. "I'm here to say thanks to the fans. 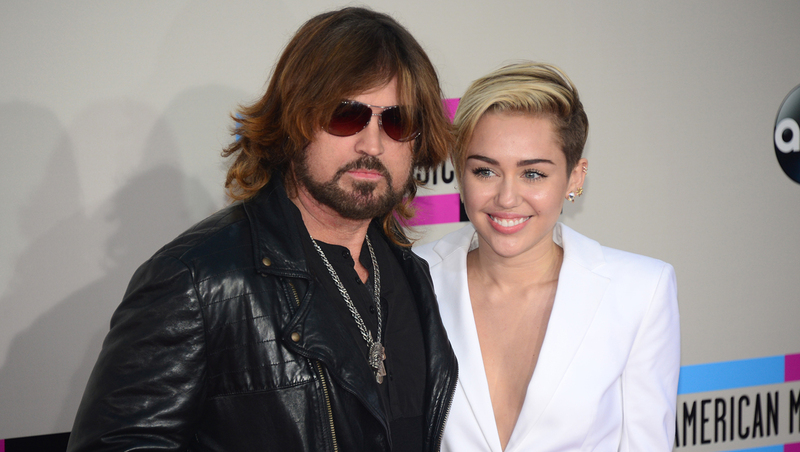 Their love and support has been tremendous," Billy Ray said on the red carpet, according to People. "She's doing much better, thank you for asking," he told reporters. "You know, right now we're just getting her back, healthy. She had an allergic reaction to antibiotics. She's feeling much, much better. The tour resumes this weekend, and Bangerz train is back on track." Miley had been on the road as part of her Bangerz tour when she became ill. She was forced to cancel and reschedule the remaining U.S. dates of her tour to August. She also had to delay the start of the European leg of her tour, which was supposed to kick off Friday in Amsterdam but will instead start May 6 at London's O2 Arena. The Amsterdam gig, as well as a canceled Antwerp date, have been rescheduled to June.